The Reverend Michael E. Bartolomeo has served as the 19th rector of Trinity Church since September 2011. Fr. Bartolomeo is a child of the diocese, having grown up in Centereach and attending St. Mary’s Church in Lake Ronkonkoma. He obtained his Masters of Divinity from Seabury-Western Theological Seminary in Evanston, Illinois, in 1993, was ordained a deacon in 1995, and a priest in 1996. 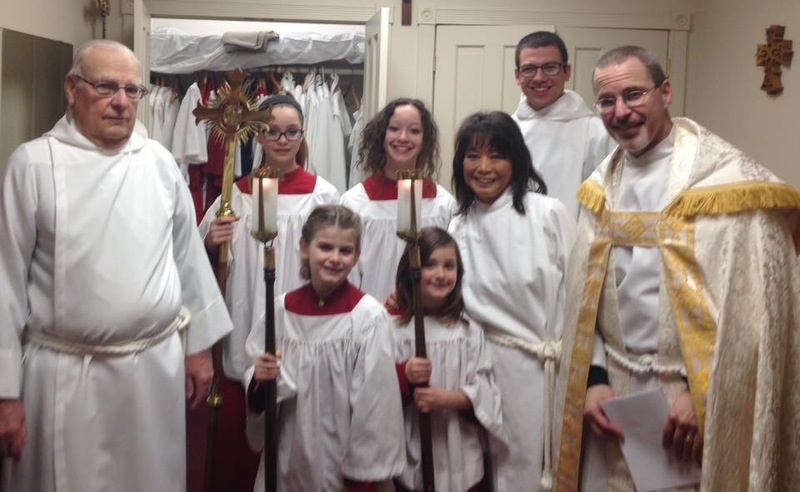 His entire professional ministry has taken place within the Diocese of Long Island, as he has served as Curate at St. Marks Church in Islip from 1996-1999, as rector of St. James Church in St. James from 1999-2004, and as a supply priest from 2007-2011. At the diocesan level he has served on the Diocesan Council, the Department of Budget (as chairperson), and the Board of Directors of the George Mercer School of Theology. In the secular world he worked as an Assistant Vice President of American Community Bank from 2004-2011. Fr. Bartolomeo has been married to his wife Joanne since 2000. She teaches sixth grade in the Brentwood School District, and has been an active Christian all her life. Within the parish she coordinates the Breakfast Fellowship and the Prayer Warriors, and serves as a lay reader, lay Eucharistic minister, and as one of the parish’s lay delegates to Diocesan Convention. Joanne’s son Matthew Vita works in the insurance business and has a son named Giovanni. Joanne’s daughter Melissa Ippolito is a registered nurse. Her husband Michael Ippolito is a police officer . Melissa recently gave birth to a son, Milo. They live in Bay Shore. Michael’s son Michael is a librarian. He lives in West Islip. Fr. Bartolomeo & Joanne also live with their dogs Whiskey and Onslow. William Morris has recently joined Trinity’s staff as Organist/Choirmaster. He is a graduate of Barrington College (Rhode Island) School of Music and has been an organist/choirmaster for over 45 years across several denominations and churches on Long Island and Rhode Island. While in college he accompanied seven operas and afterwards was the music director for the musicals Godspell, Kismet, Anything Goes, and The King and I. He had recently retired after ten years at St. Thomas of Canterbury Episcopal Church in Smithtown. He currently sings with the Huntington Choral Society, and resides in Huntington Station with his wife Angie (a retired school teacher and musician) and has 3 children and 6 grandchildren who all live locally. Together with Angie they have directed many church musicals involving children and adults. He was Confirmed in the Episcopal church in 2012. Mrs. Cheryl Kendrick has been working at Trinity since 2011. She resides in Smithtown with her husband Paul, who designs cockpits for airplanes. Her daughter Lauren is a recent graduate from the University of Vermont and is a Certified Athletic Trainer. Her son Jon is attending Michigan State University. Cheryl also serves as a Lay Eucharistic Minister at St. Thomas of Canterbury Episcopal Church in Smithtown. Ms. Eliza Gilner grew up at Trinity and is a life-long resident of Northport. She has served as sexton since 2016. Carolanne Darrigo began in December 2017. She teaches Sunday School and attends Trinity with her husband Paul and sons Liam and Christian.